I used to buy this product so often in my own country. I came from tropical country. And I think the women would always like to have white skin. At least they want to have healthy skin. lotion product that we could find in the stores. I did try few products as well. But after I tried Vaseline Whitening Lotion, I never want to change whitening lotion anymore. 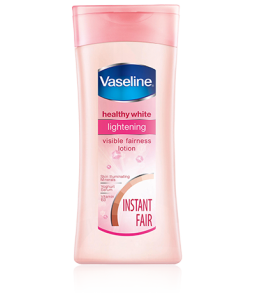 Of course you will not get white skin immediately just after applying Vaseline Whitening Lotion for one or two times. You really need to apply the lotion daily in order to get the best result in your skin. taking a bath. Since this product also give moisturizer to my skin, I don’t have to apply another moisturizing product on my body skin anymore. And in the night, I also applied Vaseline Whitening Lotion before I go to bed. using this product, I can see that my skin color change more lighter. And people around me said that my skin look more bright. I am so happy with this product. Pity that I could not find this product in the place where I live now. I live in New York city USA, few parts of my body getting darker so m getting worried. I m not sure what to use? I have searched a lot on internet n have read these columns. But i do not know who to believe this is my first time here or even looking something online like this. So bit confused, on the other hand i was trying to know from where i can get VASELINE WHITENING BODY LOTION or NIVEA NIGHT WHITENING BODY MILK. Please please please if any of you out there can tell me from where i can get this….. I`ll really appreciate that. May GOD bless you n Happy Holidays. Both of these products are available in the retail market in the USA. You should easily find them. These are also available on Amazon. I am not giving any link of Amazon, as it is always listed there. I have never seen anyone using Nivea Night Whitening Body Milk, and hence unable to suggest anything. However, I can recommend you about Vaseline Whitening Body Lotion. This is a lotion which is supposed to be used externally and hence there shouldn’t be any problem even if you are going to use it for extended duration. how many weeks before your skin gets lighter ??? because I`m planning to buy this product .. and I want to know if this is really works.. thank you ..
normally our skin naturally renew every 3 months, so I suggest use it for 3 months to see the maximum result. According to the manufacturer, you should expect result from in 2 - 3 months. If you don’t see any result within 3 months, you can consider stopping to use it.